I have a weak spot for watches that help you travel through different time zones, without losing track of home time. We all know about the GMT watches that just have an extra hour hand, to display home time (or 24h notation). However, there are also watches that can flip through different timezones with only a push on a button or turning an extra crown. Technically speaking, these watches are much more complicated than the ones with ‘just’ an extra hour hand like the Rolex GMT-Master or ETA 2893-A2 based watches (Omega, Linde Werdelin etc.). Since 2007, this reference is available in 39mm in diameter (instead of 37mm) which makes it an even more interesting watch that it already was for me. The P in the reference number stands for Platinum, the material of the case and clasp. The guilloché pattern dial in metallic blue is just mesmerizing imho. The pusher at 10 o’clock will guide you through the 24 different timezones, indicated with city names per time zone. The caliber 240HU movement has all the Patek-works in terms of finish, including a 22ct gold rotor. 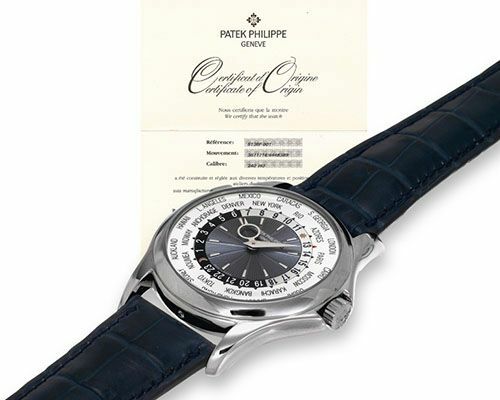 A Patek ref.5130 P can be found for approx. 30.000 euro / $39,000.00 USD. JLC’s World Geographique is one of my all-time favorite watches from this famous manufacturer. By using the crown on 2 o’clock, you can select a city from the city disc and the sub dial at 7 o’clock will show this ‘priority time’. The city disc also indicates how to operate in case daylight savings (summer time) are applicable. JLC’s caliber 936 movement is – of course – an in-house movement and consists of 322 parts for this complication timepiece. 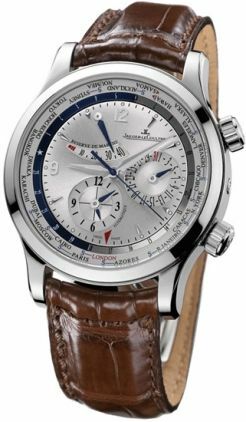 You should be able to find a stainless steel JLC World Geographique (as pictured above) in the range of 7.500 – 8.000 euro / $9,650.00 – $10,400.00 USD. 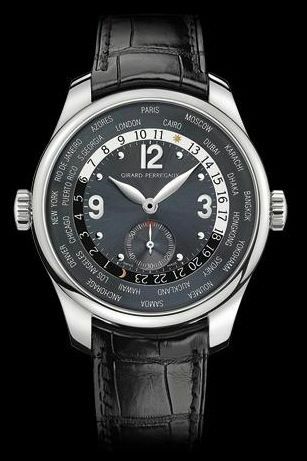 Girard-Perregaux has been producing WW.TC models for 10 years now, this ‘Small Seconds’ version being the most basic model. As far as we can speak about ‘basic’ anyway. The other WW.TC models feature a chronograph or even a perpetual calendar. Then there’s the WW.TC ‘Financial’, to keep track of the opening and closing of the world’s main stock markets. I’ll keep it basic here, the ‘Small Seconds’ model cover all my needs when I travel. Ticking inside this WW.TC is GP’s in-house movement caliber GP03300 with a modest power reserve of 46 hours. I haven’t seen this particular model for sale yet, but list price is approx. 9,400 euro / $12.200,00 USD. Of course, this top 3 is my own top 3 and does in no way reflect the top 3 best world timers or whatever. The Patek Philippe is most desirable I think, and I could settle for the white gold version as it is much cheaper. The Jaeger-LeCoultre would be my number 1 choice when I would be in the running for a world timer watch though. A superb timepiece for a price that I could justify (if I need to). However, Nomos will be releasing their ‘World Timer’ in Q2 of 2011 and that one will be approx. 3450 euro. I had the pleasure to fiddle around with it during SalonQP, and was very impressed. What is your favorite World Timer watch? Please respond using the Comments option below.